Mix all the ingredients together, except for the cooking oil. Portion into small balls, about 1/8 cup size balls. Use a small ice cream scooper to get even sizes. 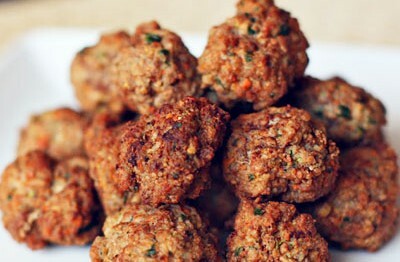 Lightly roll into balls without packing tightly to keep it from getting dense and dry inside once cooked. Heat up the oil in the pan and fry in batches. Do not overcrowd the pan and handle as minimally as possible to keep it from losing shape or falling apart. Once golden brown, set on a paper towel to drain excess oil.